— L. Ron Hubbard, Religious Philosophy and Religious Practice, 21 June 1960, revised 18 April 1967. — L. Ron Hubbard, The Reason Why; 15 May 1956. The work of L. Ron Hubbard has been surrounded by controversy since he first announced his "modern science of mental health" in 1950. His followers assert that he is not only the reincarnation of Buddha but also Maitreya, who according to Buddhist legend will lead the world to enlightenment. Most people come to Scientology when their lives are in crisis. Scientology uses manipulative recruiting techniques to heighten vulnerability, and falsely promises a solution for almost any problem. From the beginning, the new recruit is subjected to techniques which induce euphoria. The desire for this euphoric state can be likened to a drug addiction, often rendering members all but incapable of critical thinking with regard to Scientology. "The evidence portrays a man who has been virtually a pathological liar when it comes to his history, background and achievements. The writings and documents in evidence additionally reflect his egoism, greed, avarice, lust for power, and vindictiveness and aggressiveness against persons perceived by him to be disloyal or hostile." — California Superior Court Judge Breckenridge, speaking of L. Ron Hubbard, in a 1984 decision. Hubbard said that his interest in the human mind was sparked by a meeting with Commander Thompson, a U.S. Navy doctor, when he was twelve. However, Hubbard's extensive teenage diaries — used as evidence in a California court case — show no interest in psychological or philosophical ideas. Hubbard told his followers that he spent five years between the ages of fourteen and nineteen — travelling alone in China, Mongolia, India and Tibet, and studying with holy men. He did not actually visit Mongolia, India nor Tibet. His two visits to China were short excursions in the company of his mother. Hubbard confessed the brevity of his Chinese stay in an interview with Adventure magazine in 1935. In February l940, Hubbard talked his way into membership of the Explorers' Club of New York and was awarded an expedition flag for his proposed "Alaskan Radio Experimental Expedition". Hubbard was trying out a new system of radio navigation, and used the "expedition" to beg equipment to refit his 32-foot ketch, the Magician. Claims made by the Scientologists that the expedition was commissioned by the U.S. government are unfounded. Writing to the Seattle Star in November 1940, Hubbard complained that the "expedition" had been hindered by repeated failures of the Magician's engine. Hubbard and his first wife spent most of their time stranded in Ketchikan, Alaska, while he tried to write enough stories to pay for costly engine repairs. Eventually, he used borrowed money to leave Alaska — money he failed to repay. In an article called "My Philosophy", Hubbard claimed to have been "blinded with injured optic nerves, and lame with physical injuries to hip and back, at the end of World War II ... My Service record stated ... 'permanently disabled physically'." Elsewhere, Hubbard said that a few days before the end of the war, he managed to get the better of three petty officers in a fight in Hollywood. "Hypnotism was used for research, then abandoned." — L. Ron Hubbard, Dianetics: the Modern Science of Mental Health. In a 1909 lecture, Freud explained a method for uncovering traumatic memories. Patients were asked to recall earlier and earlier life incidents on a "chain" until the emotional "charge" was released. Hubbard not only took the technique, he even retrained several of the expressions used by the translator of these lectures. Freud had abandoned the technique, because it was laborious and completely failed to uncover key repressions. In fact, after sometimes providing initial relief, Dianetics all too often deteriorates into the dangerous conviction that entirely imaginary incidents are literal truth. Hubbard took Freud's technique, added a little of the then-popular General Semantics, and asserted that the "basic" or original traumatic incidents had occurred in the womb. In this he was following the work of Otto Rank, Nandor Fodor and J. Sadger. Hubbard also asserted that it was actually possible to recall prenatal incidents, right back to conception (the "sperm dream''). Fodor too had written of prenatal memory. Hubbard's following diminished as people realised that his claims were grossly exaggerated, and with the collapse of the first Dianetic Foundations and Hubbard's second marriage. Sara Hubbard charged that her husband had tortured her with sleep deprivation, drugs and physical attacks. She claimed that he had once strangled her until the eustachian tube to her left ear ruptured, leaving her hearing impaired. Hubbard fled to Cuba, after seizing their baby daughter, in what proved to be a successful attempt to silence Sara. The new Wichita Foundation soon ran into trouble, and Hubbard abandoned it to its creditors, accusing Don Purcell — who had earlier saved him — of accepting $500,000 from the American Medical Association to ruin him. This was far from the last display of paranoia of Hubbard's part. — L. Ron Hubbard, Philadelphia Doctorate Course lecture 20, 1952. He also gave the Hubbard College lectures to a tiny audience, and within six weeks had created a new subject apparently out of thin air. 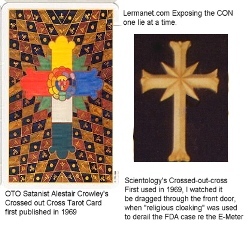 He was later to admit his admiration for Aleister Crowley ("my very good friend") and in fact the fundamentals of Scientology have much in common with Cowley's "magickal" ideas — mixed in with a large helping of science fiction. With Scientology, Hubbard asserted that we are all spiritual beings ("theta beings", and later "thetans"), who have lived for trillions of years, incarnating again and again. He claimed that through the use of his new techniques, anyone could achieve supernatural powers. In 40 years, no scientific evidence has been provided for these claims. — L. Ron Hubbard to Lloyd Eshbach, in 1949; quoted by Eshbach in Over My Shoulder. In 1991, a letter to Scientology recruiters offered a course teaching "how to tell people the results of their OCA so that they will reach for Scientology". Another internal document says that the Test Evaluator "is to point out to the person by means of a personality test evaluation what is ruining his life, and to show him how Scientology can save him from that ruin ... when you point out a low score ... say 'Scientology can handle that'." The test is designed to ensure that very few people have an acceptable personality profile. "Scientology is evil; its techniques evil; its practice a serious threat to the community; medically, morally and socially." — Report of the Board of Inquiry into Scientology for the state of Victoria, Australia, 1965. The sequence of steps on the Scientology Bridge has changed from one year to the next. After the "Purification Rundown' — and another interview with a salesperson — the recruit might well go on to the "Hubbard Key to Life Course" (at a cost of £4,000 or $8,000). This supposedly undercuts all previous education by returning the individual to the basics of literacy. Factually, because it treats all clients as pre-school children, it tends to cause age regression, making people yet more susceptible to Scientology. In "Opening Procedure by Duplication", for example, the auditor and the client or "pre-clear" are alone in a room with a table at either end. On one table is a book, on the other a bottle. The preclear will be instructed, with unvarying wording, to look at the object at the other side of the room, to walk over to it, to pick it up and to identify its colour, weight and temperature. Sessions often run to two hours, and cases of 18 such sessions for this single "process" are not unheard of. Eventually, this arduous ritual leads to a sensation of floating, believed to be "exteriorisation from the body" in Scientology — but a common side effect of hypnotic trance. The Scientology Bridge is laid out in a series of steps, or grades, each with a purported result. On Grade Zero, for example, clients are meant to achieve the ability to "communicate freely with anyone on any subject". A Grade One "release" is supposedly without problems. There are two further release grades, before the "preclear' starts on the current form of Dianetic auditing. In New Era Dianetics, the preclear is asked to re-experience incidents from "past lives", which can lead to strange delusions on the part of Scientologists, compensating for the shortcomings of their real lives. Through Dianetics, preclears are supposed at last to be Clear, with the realization that they no longer need their "Reactive minds", where engrams are supposedly stored. In 1952, Hubbard claimed that after Scientology auditing and indoctrination anyone would become "capable of dismissing illness and aberration from others at will". Scientologists have undertaken hundreds, and sometimes thousands, of hours chasing this illusion and Hubbard's often-repeated promises of supernatural abilities. In the late 1960s, Hubbard released his Operating Thetan levels. An Operating Thetan is an individual supposedly capable of "operating" without need of a body, and Hubbard made many sugared claims for his extremely expensive OT levels. On OT 8, Scientologists are allegedly taught that they exist in parallel universes, and are told to disconnect from their parallel selves. Finally, the Scientologist is to re-experience moments of his or her own creation, and discover any abandoned aspects of the self. This supposedly leads to a major realization about God. Former members who have suffered through this nonsense assert that the desired realisation is that Hubbard created all the living beings in the universe. A leaked OT 8 Bulletin, which may or may not be genuine, claims that Hubbard is in fact the antichrist. Hubbard put to sea with his closest followers in 1967. Aboard ship, anyone who displeased him was confined to the chain locker. Here the victim would crouch in bilge water and excrement in total darkness, surrounded by rats, sometimes for as much as two weeks without respite. Even children were put into the chain locker on Hubbard's order. In 1968, the chain locker punishment was supplemented by "overboarding", where people, even non-swimmers, were hurled from the decks into the sea. In 1973, Hubbard replaced these cruel and unusual practices with a new and profoundly effective form of humiliation — the Rehabilitation Project Force, or RPF. The RPF is still in use in Scientology organizations throughout the world. Those who fail to comply with orders, make mistakes or simply fall short of their production quotas are put onto the RPF. RPFers can only speak when spoken to, they are meant to eat table scraps, sleep even shorter hours than other staff, and comply immediately and unquestioningly with any order. They work a full day, doing physical labour, and are then expected to spend five hours confessing and hearing the confession of their RPF partner. "Our organizations are friendly. They are only here to help you". — L. Ron Hubbard, 'Dianetic Contract', 23 May 1969. Through the 1950s, Hubbard advocated ever-stricter measures to deal with critics and defectors. Hubbard's Church has always campaigned actively against anyone who uses Scientology techniques without following orders and paying tithes. Speaking of a hypothetical splinter group in 1955, Hubbard wrote, "if you discovered that some group calling itself 'precept processing' had set up ... in your area, you would do all you could to make things interesting for them ... The law can be used very easily to harass, and enough harassment ... will generally be sufficient to cause his [sic] professional decease. If possible, of course, ruin him utterly." The large amounts of money demanded by Hubbard, and the severe treatment meted out to his followers, inevitably led to public concern. Enforced "disconnection" has torn many families apart. Scientology was castigated by a government inquiry in Victoria, Australia, in December 1965. In February the following year, Lord Balniel requested that the British parliament launch an Inquiry — Hubbard responded by setting up the Guardian s Office, and reinforcing his policy of "noisy investigation" into anyone who criticised Scientology. As Hubbard said, "The DEFENSE of anything is UNTENABLE. The only way to defend anything is to ATTACK." For several years, Narconon has tried to establish a large centre on the Chilocco Indian reservation in Oklahoma in December 1991, the Oklahoma Mental Health Board denied certification to this centre, ruling that "there is no credible scientific evidence that the Narconon program is effective". The program was also judged "unsafe". The Board complained that not only was medical supervision inadequate, but that graduates of the program were immediately taken on as staff. In Narconon, alcoholics and other addicts are not educated about substance abuse, but are simply put through the program. The Board also complained that "the Narconon treatment plan is general in nature, applies categorically to all students and is not individualised." The Board reported that Narconon did no follow up studies (which, of course, dismisses any claim to the program's efficacy), and had inadequate discharge Planing. There was also particular concern that Narconon clients, including alcoholics, are told that if they are not able to drink after the program, then the program is simply not complete. Hubbard's "Purification Rundown" is at the heart of the Narconon Program. The Purification Rundown supposedly rids the body of drug residues through massive doses of vitamins, and five hours a day of ruining and sweating in a sauna. The Oklahoma Mental Heath Board complained of inadequate control of sauna temperature, and warned of the potential dangers, particularly to heroin addicts, of sauna use. "Reference was made to some unusual features of membership and to the strong commercial emphasis ... Regardless of whether the members ... are gullible or misled or whether the practices of Scientology are harmful or objectionable, the evidence ... establishes that Scientology must, for relevant purposes, be accepted as 'a religion' in Victoria." Hubbard claimed that Scientology is non-denominational and does not clash with any religion. The claim is preposterous. In his secret writings, Hubbard asserted that Christ is a fabrication, an implanted hypnotic suggestion. Yoga, and therefore Hinduism, he dismissed as "booby-trapped"... In one interview, he said that his favourite book was Twelve Against the Gods, where author William Bolitho called Mahomet a psychopath. Of course, the doctrine of reincarnation which is essential to Scientology, is unacceptable to Judaism, Islam or Christianity. Scientology contradicts the teachings of all of the major religions by propounding that great wealth is a virtue, a measure of spiritual success. Hubbard divided the "urges to survive" into eight "dynamics". These are survival as or through self, family and procreation, groups, mankind, life forms, the material, the spiritual and infinity or the Supreme Being. Hubbard claimed that to make a sensible decision, it was only necessary to determine the effect upon these "dynamics", and choose the route which benefited the greatest number. No special place is given to the eighth dynamic, or God,, in this scheme, so it is possible for a decision to be taken because it advantages the majority of the other seven dynamics. This practice is unconscionable to all who believe in God. Hubbard also dismissed the notion of compassion. Scientologists believe that everything that happens to an individual is self generated, so the unfortunate are called "victims'', who have "pulled in'' their misfortune. Sympathy is frowned upon, and considered to be a "lower" emotional reaction than fear or anger. All transactions must receive a proper "exchange", so Scientologists do not tend to work for, or donate to, charities (other than their own front groups). As Hubbard put it, "When you let a person give nothing for something you are factually encouraging crime". Scientology induces contempt for all non-Scientologists, who are called "wogs" or "raw meat". "When somebody enrols, consider he or she has joined up for the duration of the universe — never permit an 'open-minded' approach ... If they enrolled, they're aboard, and if they're aboard they're here on the same terms as the rest of us — win or die in the attempt. Never let them be half minded about being Scientologists ... When Mrs. Pattycake comes to us to be taught, turn that wandering doubt in her eye into a fixed, dedicated glare ... The proper instruction attitude is '... We'd rather have you dead than incapable.'" — L. Ron Hubbard, Keeping Scientology Working, 7 February 1965, reissued 27 August 1980. "Advanced Courses [in Scientology) are the most valuable service on the planet. Life insurance, houses, cars, stocks, bonds, college savings, all are transitory and impermanent ... There is nothing to compare with Advanced Courses. They are infinitely valuable and transcend time itself." — L. Ron Hubbard speaking of his "Operating Thetan Courses" Flag Mission Order 375. Another alarming aspect of Scientology's greed is the sale of Hubbard artefacts, called "Special Properties" limited editions of Hubbard books and anything signed by Hubbard. These artefacts are pushed onto Scientologists with the insistence that they are highly marketable commodities with great investment potential. In reality, they are virtually worthless outside the confines of the Scientology world. Outrageous amounts are charged for these items. One former member was induced to spend some £26,000 (of which £10,000 was borrowed), with promises that the value of these "Special Properties" would rocket. Despite making extensive enquires over a seven year period, the "Special Properties" have proved unsaleable at anything like the price originally charged. The former member purchased a single, signed photograph of Hubbard for over £8,000. This is not an isolated case, one Scientologist spent an incredible £90,000 on "Special Properties". Scientologists are expected to pay out thousands towards courses, and then have to purchase ridiculously expensive books, course packs, E-meters, and tapes of Hubbard lectures as a prerequisite to taking each course. The tapes generally sell for about £30 each, and Hubbard gave thousands of lectures. Every Scientologist is expected to buy at least two E-meters, ranging from £700 to £2,750 each. The components from which an E-meter is constructed make up only a fraction of this cost. "Handling truth is a touchy business ... Tell an acceptable truth." — L. Ron Hubbard, The Missing Ingredient, 13 August 1970. In his 1984 ruling in the California Superior Court, Judge Breckenridge stated, "In addition to violating and abusing its own members civil rights, the organization over the years with its 'Fair Game' doctrine has harassed and abused those persons not in the Church whom it perceives as enemies." "...the Church's conduct was manifestly outrageous. Using its position as his religious leader, the Church and its agents coerced Wollersheim into continuing 'auditing' although his sanity was repeatedly threatened by the practice ... Wollersheim was compelled to abandon his wife and family through the policy of disconnect. When his mental illness reached such a level he actively planned his suicide, he was forbidden to seek professional help." Jon Atack's book, A Piece of Blue Sky (lSBN 0-8184-0499-X), is published by Lyle Stuart Books in the USA, and by Musson Book Company in Canada. A Piece of Blue Sky is a 400 page history of Hubbard, his organisations and his techniques. It is available in the UK by calling 01342 316129 (0044 1342 316129 in the rest of Europe). Margery Wakefield's The Road to Xenu is an excellent first-hand account of membership, and includes Bob Penny's thought provoking Social Control in Scientology. The Road to Xenu is available via P.0. Box 290402, Tampa, Florida 33687.